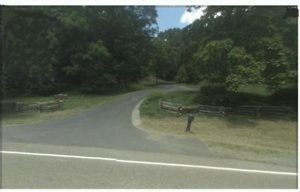 Look for the road to rise above the railroad tracks which are on the right, Slow down at the crest of the hill, as you start downhill– Driveway on the left. For those arriving for lessons: The Riding Ring is an immediate left at the top of the hill! If you continue straight, you will drive to the house and will need to go around the circle drive and come back to the riding ring. For those arriving for trail/orienteering lessons: Please continue to the circle drive at the house.